In order for ESI Builders to deliver you the luxury home of your dreams, there is a lot of planning that needs to go into the project before breaking earth. That planning actually begins with you, possibly before you even contact us to discuss your custom home, and will continue with our guidance during your initial meetings with our design team. As you begin to think about what your perfect home actually looks like, you make want to take into consideration the factors listed below. The first thing to consider when planning your custom home build is the size and topography of the lot. You’ll need to think about how much of a yard you’d like to have once the house is built. Do you want a large lawn big enough for children or pets to play in, or would you prefer a small yard that is easier to maintain? Would you prefer a flat lot, or an upward or downward sloping lot? A downward-sloping lot could assist with site drainage and allow for a walk-out basement, but a steep slope could require extensive earth-moving and soil stabilization work, thus raising the costs of a build. Once you’ve made a decision about the size and topography of your lot, you’ll need to decide how you want the custom home to be positioned on the lot. One very important factor to consider here is the position of the home relative to the sun. Do you want the afternoon sun shining in your back yard, or would you prefer shade? Would you prefer more natural light during certain times of the day in certain rooms of your house (for example, morning light shining in the kitchen)? Also, keep energy costs in mind—there is a balance between having natural light in every room of the house, and overheating due to too much sun. Wind is another natural element that you must consider here, so that you can take advantage of summer breezes while still permitting extended outdoor activities in cooler weather. Our 25 years of experience building custom homes of all types allows us to give you the advice you need to make informed decisions regarding the position of your home. Another big decision to make about your custom home is how many stories it will have. One thing many people don’t realize is that a single-story home actually costs more to build in most cases than a two-story home. This is because a single-story home typically has a larger footprint, which requires more foundation and more roofing—two of the most expensive parts of a custom home. Building a two-story home can help keep costs down, but it will also make parts of the home difficult for seniors or people with disabilities to access. Are you planning on doing lots of entertaining at your home? If so, you may want to plan for a deck, swimming pool, or other outdoor space where you can entertain guests. Elaborate outdoor living spaces are becoming increasingly common, and can include elements like a fire pit, mini-fridge, and even entertainment centers. When it comes to these spaces, however, sometimes what may seem like a simple addition can add significant complexity and cost—like adding an outdoor sink, for example. 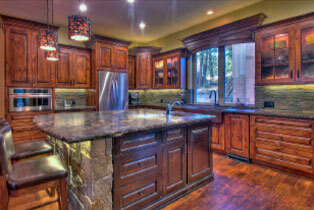 It’s very important that a custom home be designed to fit the lifestyle of the family that occupies it. A good design that gives each family member sufficient space can actually contribute significantly to the health of a family. For example, if there will be several children of different ages living in the home, having quiet space where older children can study without being disturbed by younger children playing could be very important. Also, families who enjoy watching movies together may want a specially designed media room for that purpose. Of course, having enough bedrooms and bathrooms for all the occupants is also important. As you think about all the endless possibilities for your luxury home, it’s easy to get carried away and end up way over budget. Some things to keep in mind are that the number of bathrooms in a home is a big driver of the overall cost—much more so than the number of bedrooms. Other things that will affect cost are the plumbing finishes and the number and types of doors and windows. There are many other factors not listed here that need to be considered when building a custom home, but the ones mentioned above are some of the most important. Fortunately for you, our experienced design team will guide you through all of the decisions that need to be made so that the custom home plan we create for you will be one you are very excited about.